Once upon a time in the year 2004, my sister returned from her first of now countless trips to France. Like most 21-year-olds returning from their travels abroad, she was wiser and had tales to tell of the world beyond the U S of A. One practice she had adopted after her two-month stint was the custom of an aperatif before one’s meal – particularly a gin’n’tonic (or as Maureen, her adopted nanny from England would call it, a “g-n-t”). It may seem simple and uninteresting to many, but it was a cocktail that reeked of sophistication, class, and history as she told us the story of why it is the cocktail of choice for so many Brits. Some of you may know this tale, but for those still stuck in their cultural cocoon, allow me to explain. Back in the days when the British had spread their imperial ways across the majority of Earth’s landmass, including lands plagued with malaria such as India, British soldiers needed a means to protect themselves from such deadly pathogens. Afterall, if the soldiers all died, who would enforce afternoon tea???! DEAR GOD MAN (sorry…inside joke with my sister :p )!!! So, they discovered that quinine could treat the disease, but unfortunately was incredibly bitter and distasteful. Like many things, adding a little sparkling water, sugar, lime, and gin to anything makes it go down a whole lot smoother. Thus the birth of the g’n’t!!! Now back to me. So here my family was in 2004, sitting around our kitchen table, each with a glass filled with this sparkling crisp concoction. As the kitchen table always was the site for lively discussions about our daily frustrations, delights, and philosophical delusions, the beverage became a mainstay in the Juhl family. Much like cheese, but that’s for another blog :). So I told our stunning 6’2″-Aryan waiter named Hans (well, k I don’t remember his name, but it SHOULD HAVE been Hans) that I would take a stab. And I did…twice. It was just THAT good. So here I am now, four weeks later and in a serious state of concern. There was no way I could stomach just gin and tonic water alone. 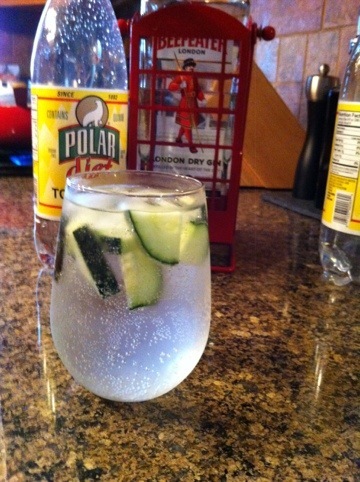 Enter my gin-cucumber revelation. Two slices of cucumber quartered and sunk in my glass later, I took a sip and had a Bogey moment, “I think this is the beginning of a beautiful friendship.” Crisis averted and family bonding time was back on track. Think I’m crazy??!! Grab a cuke and give it a try! If anything, at least think of the sugar you’ll save from switching to a food that is high in vitamins A, K, and C, as well as potassium, magnesium, and phosphorus. See – I can even make gin sound healthy ;). Take that British East India Company! I am a fourth-generation American female whose family left countries of Northern Europe 100 years ago but truly never left the culture. This left me with a passion for food, drink, and culture and a desire to connect with my European roots. Since the age of 18, I have traveled in Germany, France, Italy, Spain, and Switzerland, each time finding a piece of me that identifies with the people and the way they think - primarily how food is culture and culture must include food. These personal experiences, combined with my cultural inheritance, has shaped the person I am. I hope that through sharing my experiences I can inspire people to have a passion for these same things, to see what an intricately essential role food, drink, and culture play in our personal identity and in enhancing the quality of our lives. I served you cucumber water! Success!